Over the vast, empty reaches of interstellar space, countless small molecules tumble quietly though the cold vacuum. Forged in the fusion furnaces of ancient stars and ejected into space when those stars exploded, these lonely molecules account for a significant amount of all the carbon, hydrogen, silicon and other atoms in the universe. In fact, some 20 percent of all the carbon in the universe is thought to exist as some form of interstellar molecule. Many astronomers hypothesize that these interstellar molecules are also responsible for an observed phenomenon on Earth known as the "diffuse interstellar bands," spectrographic proof that something out there in the universe is absorbing certain distinct colors of light from stars before it reaches the Earth. But since we don't know the exact chemical composition and atomic arrangements of these mysterious molecules, it remains unproven whether they are, in fact, responsible for the diffuse interstellar bands. Now in a paper appearing this week in The Journal of Chemical Physics, from AIP Publishing, a group of scientists led by researchers at the Harvard-Smithsonian Center for Astrophysics in Cambridge, Mass. has offered a tantalizing new possibility: these mysterious molecules may be silicon-capped hydrocarbons like SiC3H, SiC4H and SiC5H, and they present data and theoretical arguments to back that hypothesis. "There have been a number of explanations over the years, and they cover the gamut," said Michael McCarthy a senior physicist at the Harvard-Smithsonian Center for Astrophysics who led the study. 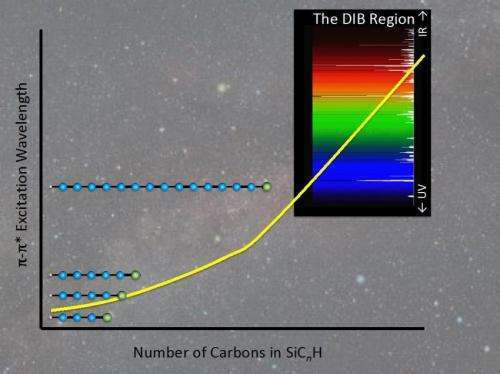 Astronomers have long known that interstellar molecules containing carbon atoms exist and that by their nature they will absorb light shining on them from stars and other luminous bodies. Because of this, a number of scientists have previously proposed that some type of interstellar molecules are the source of diffuse interstellar bands—the hundreds of dark absorption lines seen in color spectrograms taken from Earth. Armed with that information, scientists here on Earth should be able to use spectroscopy to identify those interstellar molecules—by demonstrating which molecules in the laboratory have the same absorptive "fingerprints." But despite decades of effort, the identity of the molecules that account for the diffuse interstellar bands remains a mystery. Nobody has been able to reproduce the exact same absorption spectra in laboratories here on Earth. "Not a single one has been definitively assigned to a specific molecule," said Neil Reilly, a former postdoctoral fellow at Harvard-Smithsonian Center for Astrophysics and a co-author of the new paper. Now Reilly, McCarthy and their colleagues are pointing to an unusual set of molecules—silicon-terminated carbon chain radicals—as a possible source of these mysterious bands. However, McCarthy cautioned that the work has not yet revealed the smoking gun source of the diffuse interstellar bands. In order to prove that these larger silicon capped hydrocarbon molecules are such a source, more work needs to be done in the laboratory to define the exact types of transitions these molecules undergo, and these would have to be directly related to astronomical observations. But the study provides a tantalizing possibility for finding the elusive source of some of the mystery absorption bands—and it reveals more of the rich molecular diversity of space. "The interstellar medium is a fascinating environment," McCarthy said. "Many of the things that are quite abundant there are really unknown on Earth." If you need more information about SiC 4H, please visit our website: http://www.powerwaywafer.com/SiC-Silicon-Carbide-Wafers.html.and send us email at send us email at angel.ye@powerwaywafer.com or powerwaymaterial@gmail.com.